We are Robert and Michele. Our goal is to catch a fish on the fly in all 50 states. We are full time RVing with our 2 puppies. We have a 29' camper being pulled by our f150. Construction skills, decorating skills, manual physical labor if needed. 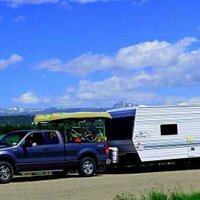 2001 29' Forest River camper. No slideouts.